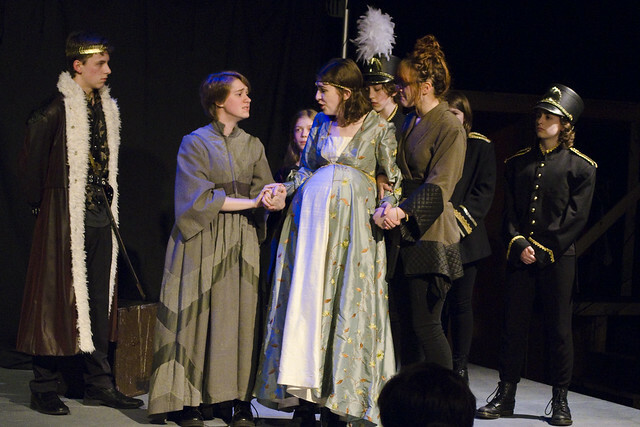 The Shakespeare Squadron offers advanced acting and Shakespeare training for young artists ages 11-18. Fall and spring semester classes provide instruction in text, poetry, acting technique, movement, voice, creating a character, and ensemble theater, with a culminating spring performance. Our students not only train in the craft of acting, but are also part of a teen ensemble that has opportunities to perform during the year—at the Shakespeare Festival in Forest Park as part of the Green Show, and at special events throughout St. Louis. Saturday Master Classes are also open to students not currently enrolled in Shakespeare Squadron. Students aged 11-18 who are interested in advanced, college-level training are eligible for admission to the Shakespeare Squadron. Students commit to weekly sessions (Thursdays, 5:30-8:30) that meet throughout the school year (October-March). Three Saturday master classes featuring guest artists will be offered as an optional, but encouraged, addition to the training. The Squadron trains weekly with intensive classical language and acting work, and learns various modes of creating devised theater. Lessons include cutting scripts, viewpoints, playwriting, myth, stage combat, directing, movement and dance work, script analysis for actors, breathwork, and more. Students will work in small groups to create 5-10 minute devised pieces based on the themes of the Festival’s upcoming mainstage production. Our culminating March showcase will feature these devised pieces, as well as a 60-minute Shakespeare play adaptation chosen by the students. Shakespeare Squadron instructors include experienced Festival Teaching Artists and guest instructors from distinguished theatre programs including Webster University, Washington University in St. Louis, and Saint Louis University. NOTE: Shakespeare Squadron’s success depends upon a commitment from each student to regular attendance and completion of class work. Members should expect to commit at least one hour a week outside of class to projects and assignments. At the end of the training course, students in good standing will be eligible to audition for the abridged production of the Festival Mainstage play during the Green Show in Shakespeare Glen, Forest Park. Shakespeare Squadron is $560 for 20 weeks of regular sessions, plus an extensive tech/dress week for performance. Click here to enroll and pay now. Master Classes may be purchased as drop-ins for $50 a class. Click here to enroll and pay now. The Festival offers a limited amount of tuition assistance for its classes and camps. Please contact Emily Clinger at eclinger@sfstl.com or (314) 531-9800 ext 106 for more information about pricing and payment. Brianna Owens is returning to Shakespeare Festival St. Louis in her sixth year as lead instructor for Shakespeare Squadron and Camp Shakespeare. She holds a BA and MA in English Literature from California State University Sacramento. As a part of the Festival’s education programs Camp Shakespeare and the Shakespeare Squadron, she has directed twelve of Shakespeare’s 38 plays. Owens is also a certified yoga instructor. Her teaching is influenced by her knowledge of breath and movement work, and her passion for language, poetry, and social justice. Delaney Piggins is excited to join Shakespeare Squadron this year after co-teaching the SFSTL summer camps in 2018. She is a recent grad of the acting program at the Webster Conservatory of Theatre Arts where she appeared in many productions and served as president of Webster’s Artists Striving to End Poverty chapter. Delaney was seen in the Festival’s 2017 mainstage production of The Winter’s Tale. She has also worked as a director and producer for SFSTL’s SHAKE 38 festival, and assistant producer on the 2018 Shakespeare in Streets production, Blow, Winds. As an actor Delaney has worked with St. louis theatre companies including The New Jewish Theatre, ANNONYarts, That Uppity Theatre Company and The Repertory Theatre of St. Louis. She is currently touring with the Rep’s Imaginary Theatre Company. Delaney’s specific interests include voice, movement, and devising as well as community outreach and body diversity in theatre. If you have any questions, please email Brianna Owens at bowens@sfstl.com.